Yet another great review HERE on Soundblab of Buzzcocks and their legendary E.P. Spiral Scratch. 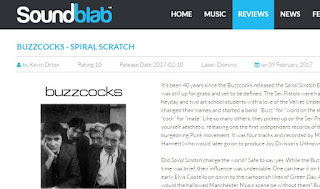 Also a reminder to all those who unlike those of us that already knew it, Buzzcocks had something special going down and 40 years on are still out there doing their stuff. Now come on Howard, it's about time we saw something from you. Please, pretty please.